Feasibility Study of Stand Alone PV System. Location: Kikwit, D.R.Congo. Size: 9,000 Wp solar PV array + Storage. Impact: 600 students per year. Payback: 9,5 years. Energy Cost Savings: 30% over system life. GHG avoidance: 269 MT= 56.9 cars off the road. Avoided CO2 of 30,307 gallons of gasoline. 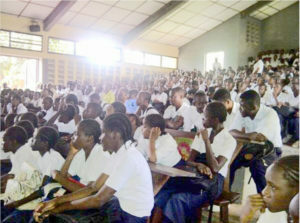 Sadisana High School is a private Jesuit school located in the rural town of Kikwit in the Democratic Republic of the Congo. The school comprises 18 classrooms, a school theater, 2 staff rooms, 2 meeting halls, and 2 laboratories. This school educates 600 boys and girls per year in sciences and is a pillar of the community in Kikwit. Every day between 4pm and 8pm, the school becomes a hub for the youth in community, it holds study time, tutoring sessions, extra-curricular and movies which require electricity. In order to have electricity, the school relies on diesel generator which incurs high operating cost, is loud and emits GHG. It uses about 4,800 litres of fuel per year (1,268 US gal/yr). The school hired SMIN Power Group to conduct a feasibility study for a solar system that would be reliable, cost effective and efficient. First, SMIN Power Group conducted a detailed audit and interviewed the customer to assess all the needs. The school daily energy need amounts to 42,000 Wh. Next, SMIN Power Group designed a stand alone solar photovoltaic system with energy storage and backup generator. The system consisted of a 9,000 Wp solar PV array, a battery bank with (28) 200Ah/12V deep cycle battery cells, charge-controllers with MPPT, (3) 3,000W inverters, and the control system. The backup generator would be used in case of need. SMIN power Group also developed the cost estimate. Long term, the system reduces energy costs by 30% for the school community. Our solution is a one-time investment and has a payback of 9,5 years. Our solution provides clean, reliable, cost effective and quiet electricity for the customer. SMIN Power Group is helping the community fight climate change to preserve the Earth for future generations. SMIN Power Group designed a system that will avoid 269 Metric Tons of greenhouse gas emissions over 25 years. According to the USA Environmental Protection Agency, this is equivalent to removing 56.9 cars off the road for a year. It is also equivalent to avoid the CO2 emissions from 30,307 gallons of gasoline.